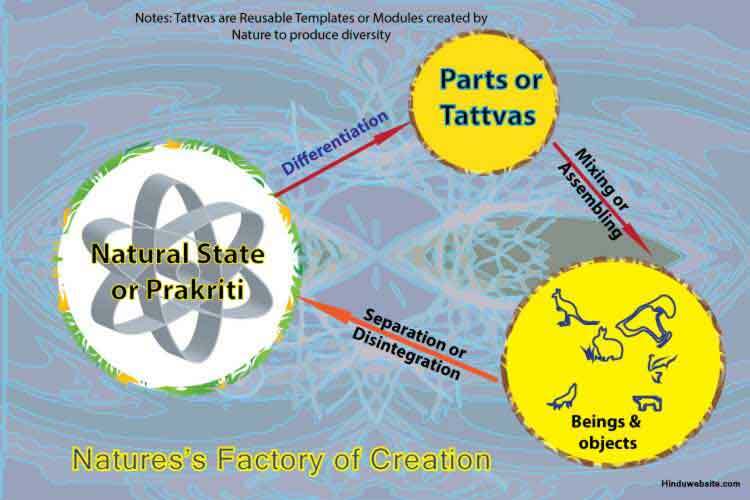 According to Hindu schools of philosophy, creation does not happen from nothingness or emptiness but from the latent forces of Primordial Nature (mulaprakriti). 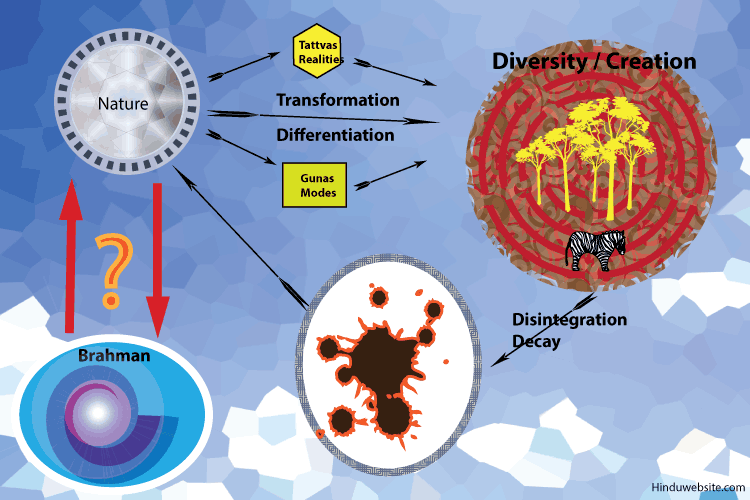 The Primordial Nature has two modes: the inactive or undifferentiated, and the active or differentiated. They are also known as asambhuti and sambhuti respectively. Asambhuti is prior to the happening of existence and sambhuti is after existence has manifested. The two states are also known in Hinduism as existence (sat) and nonexistence (asat). Nonexistence does not mean nonexistence of eternal realities but only nonexistence of manifested, transient, and amorphous realities or phenomena. In Hindu stories and Puranas, nonexistence is referred to as the Deep Sleep and existence as the Awakened states of either Brahman or Mahashakti or both. According to Hinduism, the universe is never empty or void. It is always filled with something and that something is either an indivisible One eternal principle called Brahman (God or Universal Self) or a combination of two independent eternal principles called Brahman and Prakriti (Nature). Hinduism, therefore, does not uphold the belief that creation happens from nothing, or Brahman manifests the worlds from nothing. Manifestation arises from Brahman or from Primordial Matter as a projection, extension, modification or superimposition. In other words, creation is essentially a transformative, outgoing, divergent, and evolutionary process in which one becomes many. The original state of existence is called Prakriti, the natural mode. Creation (sristhi) is a modification (akriti) of the natural modes of existence. Hindu theories of creation suggest that when it becomes active, Nature manifests many modular realities (tattvas), which combine to form beings, objects and whatever that we experience in the perceptual world. The modular realities are temporary projections of Nature that serve an important function as the reusable modules or templates very much like in a software programme. Nature uses them to create diverse forms. Nature puts these parts or tattvas in beings according to their nature and status in the cosmogony. Creation is thus not a process that happens in a vacuum. Nor does it arise from emptiness or nothingness. It arises from the natural (prakritic) state of inactive, motionless Primal Nature, when its primal mode of undifferentiated statelessness attains certain states and conditions and becomes differentiated into different modular realities, which are then assempbled in various permutations and combinations into animate and inanimate objects. Thereby what could not be seen or perceived (asambhuti) preveiously becomes perceptible (sambhuti), stateful and distinguishable. In this process of differentiation, the gunas play an important role. The gunas constitute another dimension of Nature. They are primarily natural modes which deterimine the dynamic qualities, properties, tendencies, movements, attitudes and temparament of the things and beings in creation. In the entire existence, the gunas are three only namely sattva, rajas and tamas. Hence, tthey are called the triple gunas (triguna). Sat means light and truth. Rajah means passion. Tamah means darkness. They are found ubiquitously in every aspect of existence and determine the behavior and natural disposition of things and beings. Visually you may find them as light, gray, and darkness respectively in the world. In terms of energy, you may find them as the positive, positive-negative, and negative energies or charges. With regard to motion, they represent the stable, balancing movement, the forward seeking, movement and the obstructive, resisting or opposing movement respectively. In the mind they manifest as postive emotions, passions, and negative emotions. The three gunas also determine the purity of any substance. Sattva is the purest. Tamas is the most impure. Rajas is a mixture of purity and impurity. Sattva represents all the good things in the universe that produce pleasure, happiness, harmony, name, fame, elation, lightness, progress, luxury, and comfort to beings in creation. Tamas represent all the bad things that produce pain, unhappiness, disharmony, infamy, decline, darkness, grossness, violence, and suffering. Rajas is responsible for the longing for life and for the self-willed effort of the beings to avoid the negatives in life and seek the positives as part of their effort to survive as individual and pursue their self-interests. All divine behavior of human nature arise from sattva. All egoistic and worldly passions of human nature arise from rajas. All evil, and cruel qualities arise from tamas. According to the Vedas, before creation the three gunas remain undifferentiated and in a state of perfect balance in the inactive Primal Nature (asambhuti). When Nature is triggered into the creative mode, they become differentiated, along with many modular realities (tattvas), consisting of the five elements (mahabhuta), gross and subtle senses (karanas), mind (manas), individuality (aham) and intelligence (buddhi). Mixing the gunas with elements, and other modular realities and through their permutations and combinations, Nature produces and a great deal of diversity. Thus the gunas, and the realities (tattvas) together manifest or produce the existential reality or what we call the objectified universe. The differentiation of Nature and the aggregation of the parts in the formation of beings and their bodies is well explained in the Paingala Upanishad. The process is explained as the fivefold admixture (pancikarana) of the five elements and the gunas. All the schools of Hinduism acknowledge the role of Nature in creation. The non-theistic and agnostic schools believe that from time to time Nature becomes active or inactive to produce effects from causes an later withdraw effects into their causes. Thus, when it is in an active mode (chaitanyam) all things appear, but when it becomes inactive (achetanam), all things disappear. The Samkhya school goes a step further and affirms that creation is an unfolding of preexisting causes. Every cause is latent in Nature and every effect is latent in its cause. Thus, nothing that Nature produces or creates is new. The causes become effects in their due time. For example death and decay are latent in a living body. Birth is latent in a reproductive organ. Day is latent in the night and night is latent in the day. Things appear and disapper because of prexisting causes when ideal conditions arise of prevail. The proponents of Samkhya hold that by itself Nature is an automaton, a preprogrammed entity, in which all opportunities, possibilities, and tendencies are hidden and become active when some condition, event or process triggers them. The sum of Nature's components and modes is always the same, although each of them is subject to constant change (parinamam), evolution and involution. However, the theistic school of Samakhya, which is well explained in the Bhagavadgita and which is a Vedic reinterpretation of the original Samkhya, holds that Nature becomes active when Brahman or Purusha manifests as Time (Kala) in the womb of Prakriti. Nature not only has the twin modes of activity (sambhuti) and inertia (asambhuti), but also the twin states of gross and subtle. The gross is what you can perceive through your sense organs and organs of action. The subtle is what you can feel or conceive through your individuality, intelligence, mind and subtle senses (antahkaranas). In a being these (individuality, intelligence, mind, and subtle senses) constitute the subtle body. Every aspect of creation has these twin aspects, which are manifested in stages in the evolution of things and beings, and withdrawn at the end of creation. In the creative and evolutionary process, the subtle parts or bodies develop their corresponding gross parts or bodies, whereas in the disintegrative and decaying process they become separated from them. The behavior of the gross parts affect the subtle and lead to birth and rebirth. At the time of death, the subtle bodies survive to facilitate rebirth, whereas the gross body become disintegrated into their elements. How the subtle organs behave, or how they are predisposed in a being, is determined by the composition of the gunas. For example, those in whom sattva is predominant possess higher intelligence, balance, sameness and stability. In contrast, those in whom tamas is predominant are single-minded in their pursuit of evil and destruction. Outward purity does not arise unless the subtle bodies are pure and properly aligned. In classical yoga, the aspirants attempt to purify both the subtle and gross parts of their bodies using the eight practices or methods, known as the eight limbs (ashtanga), namely rules and restraints (yama, niyama), asanas (postures), sense-withdrawal (pratyahara), breathing practices (pranayama), concentration (dharana), meditation (dhyana), and self-absorption (samadhi). These practices enable yogis not only to purify their subtle bodies, but also interact with the subtle aspects of creation through several supernatural powers (siddhis) that manifest in them with the yogic transformation. The powers enhance their mental and psychic abilities and assist them like the telescopes and infrared monitors of modern science to probe into the mysteries of existence and their own inner worlds. The world is made up both subtle and gross energies. Matter is Nature's grossest manifestation, and space and consciousness its subtlest. All that we experience in the world is a play of energy, movement of energy and transformation of energy. We breathe energy, sense energy, eat energy, store energy, communicate energy, share energy and experience energy in numerous forms. Energy is but Nature in its active mode. Our scriptures affirm that in its purest and subtlest aspect, Nature is pure energy (paramshakti). Hence, Nature is worshipped by Hindus as energy (Shakti). Shakti exists in different modes and various forms as both benevolent and malevolent. Since she is responsible for all creation, she is revered as Mother of all (jaganmata), and source of all (brahmayoni). Also, since she engages in destructive processes as part of renewal of things, she is also worshipped in her fierce and destructive forms as Kali, Durga, Chandi, etc. So far, we have not discussed the role of God in creation. There is a reason for this. There is no unanimity in Hinduism about God's role in creation. The debate has been going on among scholars for over 3000 years and the matter is further complicated with the emergence of non-theistic traditions such as Buddhism and Jainism. Overall, in Hinduism we have three fundamental standpoints about God's role in creation. They are summed up below. 1. There is no God. Only Nature exists as an eternal reality and creates everything on its own through a transformative process whereby latent and hidden causes become manifested as results or effects. After the lapse of time, Nature enters an inactive mode and withdraws or degenerates everything, except its eternal realities, into their primordial states. This is the non-theistic approach. 2. There is God, but He plays no role in creation. He remains a passive witness to the modes and actions of Nature. Both God and Nature are independent, eternal realities, and together in their passive and active roles they manifest creation. During creation, God remains immutable while Nature undergoes transformation. This is the opinion of the Shaktas, the worshippers of Shakti. 3. There is God, who is the only independent reality. Nature is an aspect of Him and acts under His intelligent, active, inviolable will. In His triple aspects, He acts as the creator, sustainer and destroyer of the worlds and beings. He manifests variously in numerous forms, and with the help of His energy (shakti) makes possible all diversity. In this process, Nature is His principal ally and obedient partner. He activates and deactivates Nature to create and dissolve the worlds. He is thus the only support and highest of all. This is the theistic approach upheld by mainstream popular Hinduism, and with some minor variations by the theistic schools such as Vedanta. In Hinduism, each of these theories has a following of its own. Since transcendental realities cannot be quantified and objectified into concrete concepts, it is difficult to determine the role of either God or Nature in creation. There is a line of thought in Hinduism, which is well evident in the Veda Samhitas, and Upanishads, which refuses to acknowledge any attributes or gender to the highest and the supreme. It therefore neutrally refers to it as "That (tat)." That can be either Nature or God or both. However, much of the remaining thinking is aligned to God as the creator and upholder and Nature as His aspect. The Purvamimnsa school focuses upon the ritual or procedural aspect of creation only, without probing into their original cause and without attributing them to a Creator. Their argument is: just practice your rituals without worrying about God, and you will be fine. In contrast, Uttaramimansa, also called Vedanta, unequivocally attributes all causes to Brahman, the cause of causes and regards Him as the highest, eternal, indestructible, and Supreme Self. It advocates devotion to God and dutiful service to His creation as a necessary condition to attain liberation. The discussion about the role of God and Nature in creation according to the diverse schools of Hinduism leads to the following conclusions. 1. There is nothing like nothingness or emptiness. The universe is filled with eternal realities, gross and subtle bodies. They always exist whether you know them or not. 2. Space (akasa) is an aspect and manifestation of Nature and a key element (mahabhuta) in the formation of subtle bodies. 3. Creation is a transformative or evolutionary natural process (prakriti parinamam) in which latent causes become their manifested effects. 4. Existence (sat) and its sub-realities (tattvas) alternate between states of activity and inertia propelled by the modes or tendencies (gunas) of Nature. 5. Nonexistence (asat) is a latent mode of Existence (sat) only. It is unknown, but not emptiness. It is incomprehensible, but not inconsequential. Its existence cannot be denied just because it cannot be reached. According to the Bhagavadgita only a fraction of the Universal Supreme Self is known and with that fraction only he upholds the entire universe. 6. Hindu schools of philosophy are certain about the active role of Nature in creation, but not so confirmative of the active role of God. 7. Hinduism believes in the cyclical nature of creation, but not necessarily in the theory of intelligent creation, because Nature is perceived in atheistic and agnostic schools as a programmed entity that manifests effects as a natural consequence of preexisting causes. The laws of physics, chemistry and mathematics affirm this standpoint. Nature is tangible in our daily reality, and it is very much a part of our conscious existence. Hence, we can clearly acknowledge its role in the manifestation of life. However, since a lot of manifestation happens in the subtle planes, unless we have strong subtle bodies, and highly developed subtle intelligence, we cannot fathom those truths and understand the creative process correctly. In Hinduism, space (akasa) is considered an important aspect of Nature. It is the subtlest of all the elements (bhutas) and an integral part of all the subtle bodies and senses. It is also the support for all the worlds and beings. Today, scientific discoveries confirm that space is not an empty phenomena, but acts more like a fabric of the universe, filled with many subtle energies, and invisible particles. Science has also proved that matter (mother, matr) in its elemental and particle state is pure energy (shakti). Science has not yet proved the role of God and perhaps it never will. Philosophically speaking, Hinduism is ambivalent about God's role in creation. Considering that human mind cannot probe beyond empirical reality, the ambivalence is perfectly justified. It is what makes Hinduism open to truth rather than to dogma.